Offseason transactions shape potential 2019 Indianapolis roster. INDIANAPOLIS - The Indianapolis Indians prospective roster is coming together as the entire Pirates organization prepares for the team's first workout in a few short weeks. Despite losing talent to international movement and players shifting between minor league teams, there is sure to be an abundance of big-league experience and talent to complement those returning to Indy. As is the nature of offseason baseball, the Pirates used their picks from the 2012-15 era as leverage in the trade market. By using multiple players with major league experience and promising numbers in the minors, the organization gained young talent for the upcoming years. RHP Tanner Anderson: Drafted in 2015, Anderson began his pro career as a starter. In late July 2017, he transitioned to the bullpen, where he recorded two wins in 10 appearances. In 2018, he continued his late-inning success with a 2.64 ERA and six saves in Indy. Anderson appeared in six games with the Pirates in 2018, recording one win in relief. When Pittsburgh added J.T. Brubaker, Mitch Keller, Jason Martin and Cole Tucker to its 40-man, Anderson was the odd man out on the roster crunch. He was traded to Oakland for a PTBNL, that player eventually being 18-year-old right-hander Wilkin Ramos. OF Jordan Luplow: In April 2018, Luplow slumped to a .180 batting average with a total of 11 hits to start the year. In May, he turned his projections around, tallying 10 multi-hit games and a .310 average for the month. Between 88 games in Indianapolis and 37 games in Pittsburgh, Luplow had 27 total multi-hit games and two multi-home run games - one with each club. More impressive, however, was his reputation in the outfield. For the Indians in 2018, he helped the team with nine total outfield assists, four completing double plays. On Nov. 14, Luplow was traded to Cleveland for utility infielder Erik Gonzalez and two young minor leaguers. UTL Max Moroff: Throughout the 2018 season, multiple single-game bests were tied, with the most notable being Moroff's trio of three-walk games. In June 2018, Moroff hit .286 with seven multi-hit games in Indianapolis to bump up his minor league average for the season to .258. He smacked two leadoff home runs as well, giving him a franchise-best four leadoff dingers dating back to 2005. In the field, Moroff primarily filled the shortstop role but also saw time at second, third and the corner outfield. Moroff was included with Luplow in the trade to Cleveland. The offseason departures that affect the Tribe roster were dominated by minor league contracts and international opportunities. Production and improvement of key contributors at the Triple-A level caught the eye of active teams overseas, while other minor leaguers sought deals elsewhere to try and work their way back to the majors. RHP Tyler Eppler: During two seasons in Indianapolis, Eppler put together his own campaign for a future spot on the Pirates 40-man roster. From 2017 to 2018, he lowered his ERA by 1.30 and cut his home runs allowed per 9.0 innings in half. He finished the 2018 campaign with 13 wins, the most by a Tribe pitcher since 2012. Unfortunately for the right-hander, those results never led to a big-league promotion. Eppler's contract was recently purchased by the Orix Buffaloes in Japan. C Ryan Lavarnway: After spending much of his career with American League organizations, Lavarnway joined the Pirates in 2018 and flourished with a .288 average and 145 wRC+, the fourth-highest mark in the International League among players with 300-plus plate appearances. He was originally drafted in 2008 by the Red Sox and saw time behind the plate in Boston during his six years with the team. Lavarnway signed a minor league contract with the Yankees for 2019. RHP Damien Magnifico: In 2018, his first and only year in the Pirates organization, Magnifico appeared in 42 games in multiple roles, four of which came as a starter. He allowed a career-low one home run through the entire season and was the recipient of Indy's Hustle & Grit Pitcher Award. Magnifico signed a minor league deal with Arizona. UTL Wyatt Mathisen: Joining Magnifico in the desert with the Diamondbacks on a minor league contract is Mathisen. He started out the 2018 season in Altoona before moving up to Indianapolis in May. From July 29 to Aug. 9, Mathisen hit safely in 10 straight games - just shy of his career best (11) - with a batting average of .351 and 12 RBI. During that span, he also set a single-game high of four RBI twice in three games. RHP Casey Sadler: As pitchers go, Sadler is as big of a utility as they come. In 2018 with the Tribe, he started eight games, finished seven, recorded one complete game, one save, a 6-5 record and 3.39 ERA. At the beginning of August, he returned to Pittsburgh after a three-year absence and made two appearances. After nine years in the Pirates organization, Sadler will be pitching on a minor league contract with Tampa Bay. UTL Eric Wood: Through July 15 last season, Eric Wood was hitting just .238 - and then August happened. Wood's bat exploded, and he hit safely in 19 of 21 starts (.364 average, 28-for-77) to end the season. That stretch included a career-best tying 10-game hitting streak, where he had 17 total hits, three home runs and a .472 average. He was signed by the Chinatrust Brothers in Taiwan this offseason. More departures from 2018: LHP Buddy Boshers, RHP A.J. Schugel, RHP Bo Schultz, C Jackson Williams. The Pirates added depth and experience via seven minor league deals, with each signing receiving invitations to major league camp. C Steven Baron: It's Baron's defense that makes him an asset. 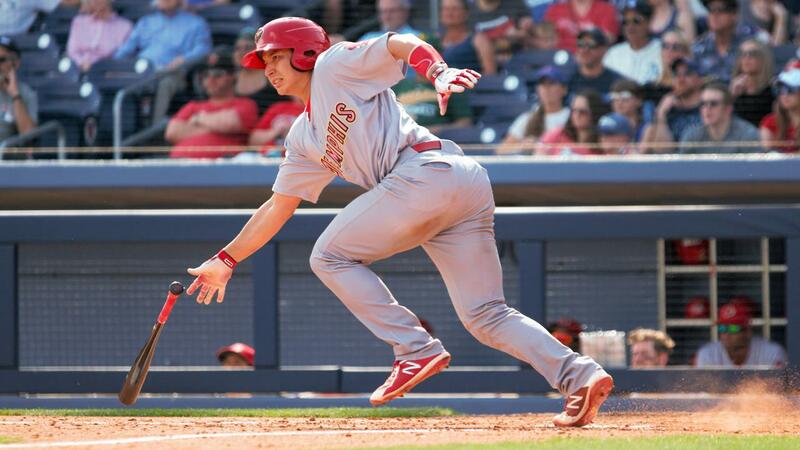 In the Cardinals organization last year, he caught 329 innings for Triple-A Memphis and committed just two errors. He also appeared in two games for the Cardinals. Over his 10-year career, he's thrown out 43 percent (240-of-558) of would-be base stealers. In 149 career Triple-A games Baron owns a .252 average, five home runs and 44 RBI. RHP Roberto Gómez: Originally from the Dominican Republic, Gómez appeared 14 times in relief for Triple-A Sacramento. He hit a new career high in runs allowed, with four on April 1. His longest scoreless streak was extended to 8.1 innings from July 18 to Aug. 10, where he recorded eight strikeouts and only one hit. 1B/OF Patrick Kivlehan: When it comes to major league experience, Kivlehan has it all. He played in 115 games for the Reds in 2017 before bouncing to New York (NL) and Arizona in 2018. He hit .298 between Triple-A Louisville and Triple-A Las Vegas and clubbed 20 home runs with the 51s. Kivlehan mainly sees time in the outfield and for good reason; in 2018 he committed only one error in 450.2 minor league innings and had seven outfield assists. LHP Tyler Lyons: Lyons has also spent his share of time in the big leagues. From 2013-17 with St. Louis, he posted a collective 3.79 ERA, including a 2.83 mark in 2017. Riddled with a left elbow sprain in 2018, he pitched in 27 games in the major leagues and had an 8.64 ERA. After coming off the disabled list he was designated for assignment and sent to Triple-A, where he made seven appearances. RHP Aaron Slegers: During a three-game win streak from May 8-20, Slegers registered an ERA of 0.90, during which time he recorded a pair of 7.0-inning outings. During the 2018 season he started 15 games for Triple-A Rochester, one year removed from being named Minnesota's Minor League Pitcher of the Year. He was drafted by the Twins in 2013 out of Indiana University and spent his entire career with the organization before being claimed off waivers by the Pirates this January. RHP Brandon Maurer: Ten years after being drafted by Seattle, Maurer found himself making 37 relief appearances with Kansas City in 2018. He also saw action in 19 games with Triple-A Omaha, tallying five saves - four coming during a 9.1-inning scoreless streak from May 19-June 16. He has a lifetime ERA of 3.89 in the minor leagues. OF J.B. Shuck: In 2018, the 31-year-old Shuck hit .327 and had a .405 on-base percentage at Triple-A New Orleans through 51 games. He came around to score 28 times for the Baby Cakes, as well. From July 29 to Aug. 7, he hit .567 (17-for-30) during an eight-game hitting streak, which included one of his four four-hit games for the 2018 campaign. In 375 minor league innings at all three outfield positions, Shuck recorded a perfect fielding percentage and only allowed one error in 231.2 additional major league innings.